Assign moderators. Assign moderators for live chat sessions to interact with the audience, remove inappropriate messages, and hide abusive users. Moderators are strongly encouraged for high-traffic events. Use keyword blocking.Compile blocked words in the Community Settings section. Live chats matching these words will be blocked. You can also block web links from being used in chat messages, if desired. Hold for review. You can have YouTube hold potentially inappropriate live chat messages. If you opt in, live chat messages that our system identifies will be held for review, and you have the final decision whether to show or hide them. There are additional gaming and live streaming tools from third parties. Learn more. After a live stream has ended, live chat replay is available on archives. When you create highlight clips from an archived video, the live chat replay can add depth to make viewers feel like they’re experiencing the real-time reactions. YouTube’s Community Guidelines apply to live streams. You can look at your metrics during and after your live stream. The live stream dashboard allows you to keep an eye on how viewers are responding during your live stream so you can quickly make adjustments. For example, if you notice a decline in live chat messages, you can ask your viewers a question or move to the next topic. Metrics will be available in YouTube Analytics 48-72 hours after your live stream ends. You can evaluate how live streams add value to your channel goals. 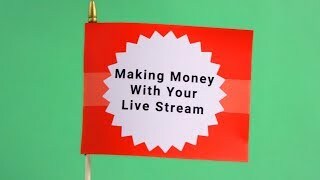 How do live streams help your channel grow? Total watch time. Look at how much watch time changed one week after you went live. Subscriber growth. Look at any gain in subscribers a few days after your live stream. What parts of your live streams are the most interesting? Peak concurrent viewers. Look at Peak concurrents (highest number of concurrent viewers during a live stream). Compare your Peak concurrents between multiple live streams. Retention. Look at how many viewers watch the entire live stream. You can try out different times of day for your live stream to see if that impacts viewer retention. Who’s watching your live streams? Demographics. Look at the gender, age, and location of your viewers. Compare your demographics between your live streams and regular video content. Once you have your metrics, decide what is working well and what you want to do with your next live stream. If your channel is setup to earn revenue on your videos, you may be eligible to earn revenue on your live streams in two ways: ads and Super Chat. Ad Type Where does the ad appear? Video ad Pre-roll and Bumper ads run before the live stream. Mid-roll video ad Mid-roll ads can be manually inserted during a live stream (desktop-only). Image ad Image ads can run beside or over content on desktop. Super Chat gives you another way to connect with your fans and to earn revenue. Through Super Chat, fans can purchase Super Chats in the monetary amount of their choice to get their message highlighted in the live stream. Check here to see if your channel is eligible for Super Chat and confirm availability in your country. If you plan to enable Super Chat, you will want to think about the best strategies to offer your fans a valuable experience. You can moderate Super Chat messages the same way you moderate live chat messages, to remove spam or blocked words. You'll receive Super Chat revenue in the same way that you receive ads revenue with AdSense.